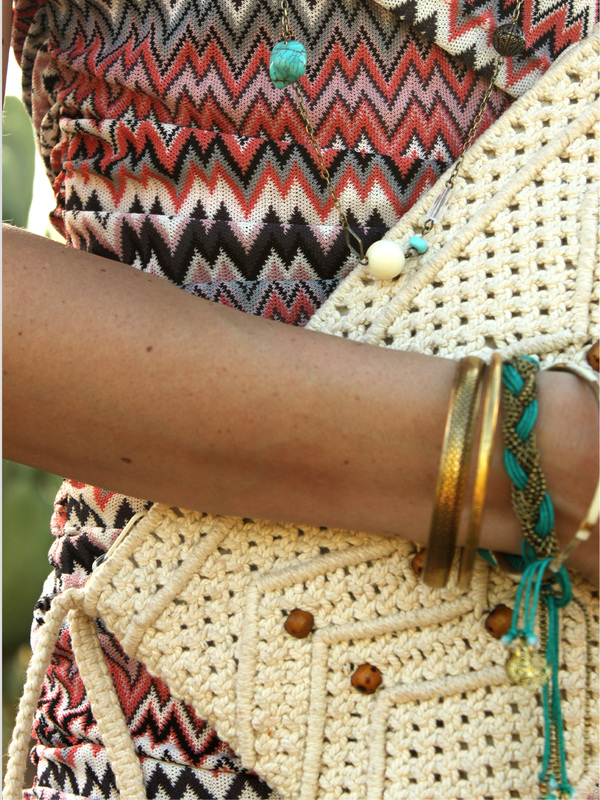 Layering bracelets. Chunky, skinny, gold, silver, bangles, boyfriend watches, simple, or statement - the possibilities of adorning those sweet wrists are endless. Layer a few or a layer a lot. There are no rules. 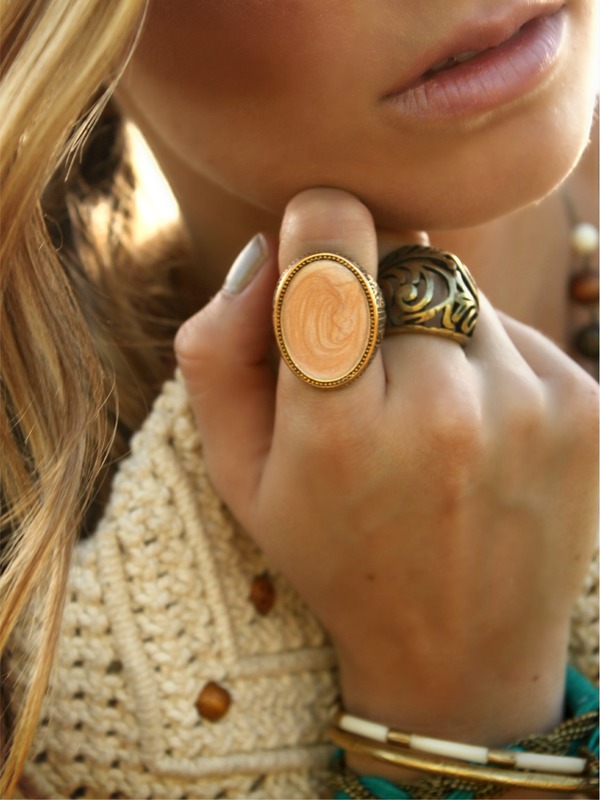 Mixing chunky rings on the same hand. Two to three is sufficient. Turquoise. It's striking, it stands out, and it is always the perfect pop of color. Especially during the summer. Prints. Switch up that little black dress for one that stands out with an interesting or fun print. It is sure to make a statement. Love the turquoise bracelet and the dress--very Missoni. Great look! 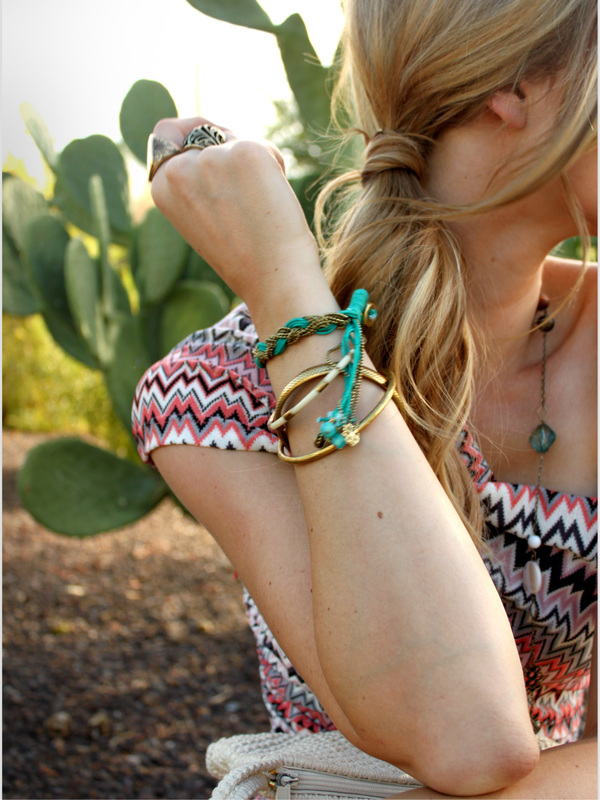 Love the turquoise accents especially the braided bracelet! The dress is beautiful, very Missoni! Love this look! I love the rings too and turquoise is my favorite pop of color too! love the whole layout. gorgeous dress! I really love turquoise too at the moment. So lovely. Love this dress! What color of lipstick are you wearing? It's so pretty and natural! Looking gorgeous as always! Love the dress and the heels! all the details here are beautiful, love your hair to the side, so pretty! i adore stackable bracelets and chunky rings. such a fun look! you are too cute. Love it! Where is the dress from? i adore that orange ish ring! I adore the dress, it fits your like a glove! I'm always a fan of turquoise in the summer! I love your obsessions and your outfit! This is such a great look! At first when I stumbled upon your blog, I thought those were pictures from a magazine or something because you look like a model! Have a great Wednesday! Okay I am brand new to your blog. I found you through Pinterest because someone posted one of your awesomely put together outfits. Love your blog! And that outfit...awesome. Love the dress. there isn't a thing i hate about this outfit! If i could walk around in that ought everyday, i would be every so happy! CUTE! Love all your accessories! I love your dress and your rings are beautiful! I love everything about this look! Your rings are gorgeous. Love the dress you are wearing! It's gorgeous. I used to have a similar printed dress, but I purchased it from a store not known for quality and it completely unraveled in the wash. Makes me so sad, but at least I got some wear out of it! I want to find another one like this to add to my wardrobe! Completely agree on the turquoise! I just found a necklace at Goodwill made of ALL turquoise nuggets for --- 5.99. It was the greatest thing I have ever thrifted. I love the dress, jewelry, EVERYTHING! Really gorgeous outfit, love it! Rings look great as well!